I remember being at my Grandma Steffens' house when I was about 6 or 7 and she asked what I wanted for lunch. Macaroni and Cheese. It was the only thing I would eat when I was younger. It was an obsession. A problem. The only macaroni and cheese I would eat came from a blue box. In fact, at least once a week you can bet that I'm still treating myself to a box of Kraft Macaroni and Cheese. On that day at my Grandma's house I can remember her pulling a casserole dish out of the oven and putting it on the table. The top had a layer of bubbling cheese. I was terrified. What was is? Doesn't she know that Macaroni and Cheese is cooked in a saucepan, not a casserole dish? Where was the powdered yellow-orange cheese?! 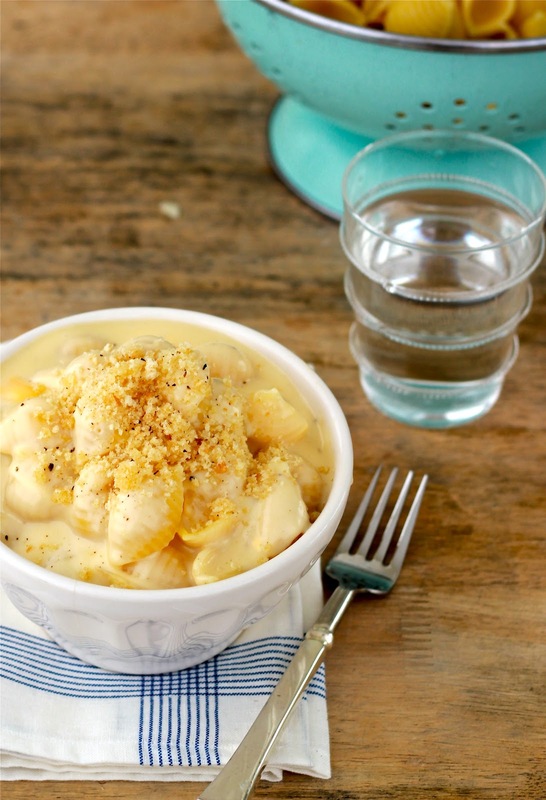 I'm not suggesting you should make this Baked Mac and Cheese recipe for your very picky 6-year-old, but I guarantee will be a big hit with anyone over the age 12. Or 18, maybe. If you really want to go for it... try my Lobster Mac and Cheese - great for Valentine's Day... Would be great with a Pan-Seared Filet Mignon! Add shredded cheeses, stirring until melted and smooth. Season with cracked pepper. Set aside. Cook pasta until almost done - making sure it is not completely cooked. Strain the pasta. Add pasta into the cheese sauce and stir to coat the pasta. Pour into a baking dish. To make breadcrumbs, pulse bread in a food processor until it is in fine crumbs. In a small skillet, melt remaining two tablespoons of butter, add the bread crumbs and cook over medium heat until they have toasted. Sprinkle breadcrumbs on the top of the macaroni. Bake at 350 degrees for 20-25 minutes, until bubbly. The recipe looks delicious! But we have the "blue box issues" around here too, and even after trying Ina's recipe, my kids still want the blue box. On the other hand, my husband wants his late grandmother's mac and cheese ...which I have yet to be able to recreate. I'll try yours with elbow macaroni to see how it compares to his memory. Thanks for the recipe! I am always trying to perfect my homemade Mac 'n cheese recipe, so I was very excited to see that YOU posted a recipe. I can't wait to try this! I absolutely love your blog- your tastes are impeccable. I have made quite a few of your recipes- I love how simple and delicious they are. AS I did not make this recipe, I can look at the amounts and think it would be safe to say this would be min of 8 portions. I just discovered your wonderful blog via Pinterest, I LOVE IT!! THANK YOU. I made this last night as a side for our steak for Valentine's Day.....OHHHHHMYYYYGOOODNESSSS it was absolute PERFECTION. I tweaked it a bit, subbing smoked gouda instead of havarti just because that's what my husband prefers and it WAS Valentine's Day after all. ;) I cut the recipe in half and it fit wonderfully in my 8x8. Thank you so much for putting a time for how long to cook the roux-most recipes I've tried give color-based directions (cook until golden brown, etc) and I always mess it up. But this was PERFECT because I had specific instructions. We even used skim milk and it was divine! I can't say enough good things about this. I'm a mac and cheese fanatic and this will definitely be my go-to and my "company's coming" recipe! So, thank you thank you thank you!